Stunning, programmable reverbs with tap tempo and complete control. An Electro-Harmonix Cathedral Stereo Reverb Guitar Effects Pedal appears in Josh Klinghoffer's pedalboard in this rig rundown video. Emily Kokal and Theresa Wayman got interesting pedalboards full of great pedals, quite a few of them delays: Electro-Harmonix Cathedral reverb, Electro-Harmonix Memory Boy, Line 6 DL-4 delay modeler, DigiTech Hardwire DL8 Delay/Looper, Boss RC-3 Loop Station, besides Electro-Harmonix Small Clone Chorus and even the very rare Boss VB-2 Vibrato pedal. At 21:54 minute mark, the camera pans over the pedals, with EHX Cathedral Stereo Reverb visible. TC Electronic recently posted this photo to Facebook showcasing Hozier's pedalboard. This photo, from the Duesenberg Guitars [webblog](http://blog.duesenberg.de/?p=480), we see an array of pedals used by Johannes Strate which includes at bottom right an Electro-Harmonix Cathedral Stereo Reverb Guitar Effects Pedal. "I love the versatility of the Cathedral Reverb along with the fantastic infinite feature on it." 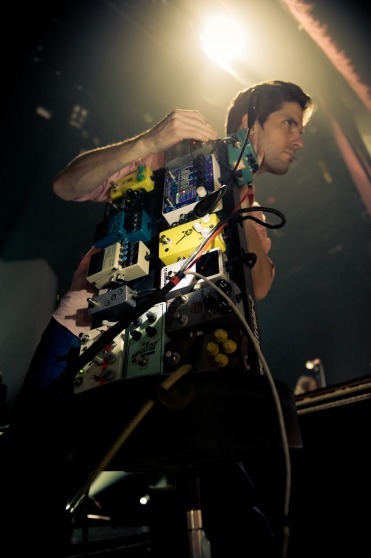 - [Todd Gummerman](http://www.pastemagazine.com/blogs/lists/2012/05/14-guitarists-talk-about-their-pedal-boards.html). Mr. Jack Conte uses the EHX Cathedral Stereo Reverb Pedal on his pedalboard. Can be seen in his pedalboard in this photo. Used in the Age of Adz tour. The Electro-Harmonix Cathedral Stereo Reverb Pedal can be seen off to the left of this pedal board. To the left of both Strymon pedal is a Cathedral reverb by Electro-Harmonix. 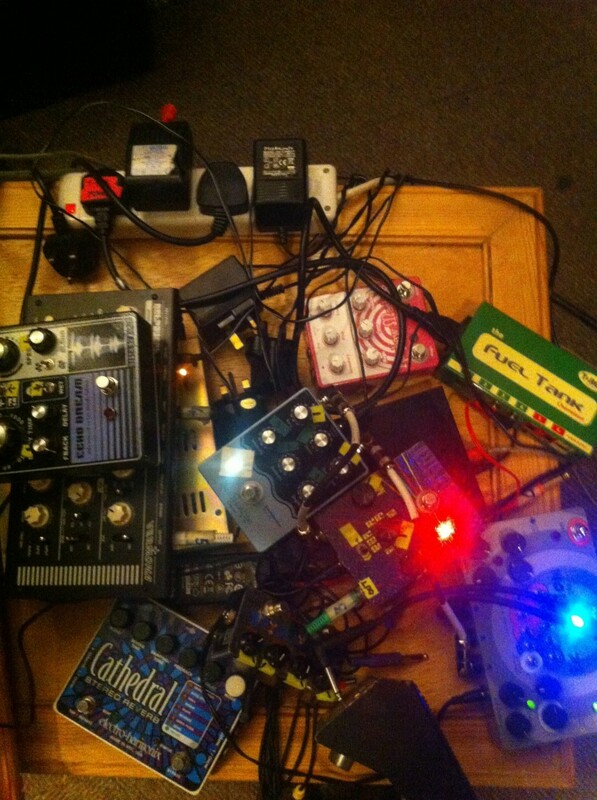 The 'Electro-Harmonix Cathedral Stereo Reverb Pedal' is clearly seen on Luke's pedal board in the photo. 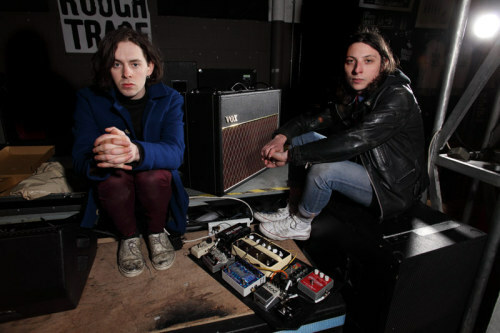 Luke like's to change pedal board with every new album, and this is from the one made for Violent Soho's 'Waco' album. During this live performance of "Trick of the Light", you can see Matt's pedalboard at 6:25, complete with the Electro-Harmonix Cathedral Stereo Reverb Guitar Effects Pedal. "Last but not least is my Electro-Harmonix Cathedral Stereo Reverb. This is by far my favorite pedal. It has tons of analog reverb types, and you have complete control over it to create your own blends and tones. It also has a very cool feature called “Infinite” where when you hold down the left button, it will maintain the reverb that was ringing at the time you hit it… infinitely! 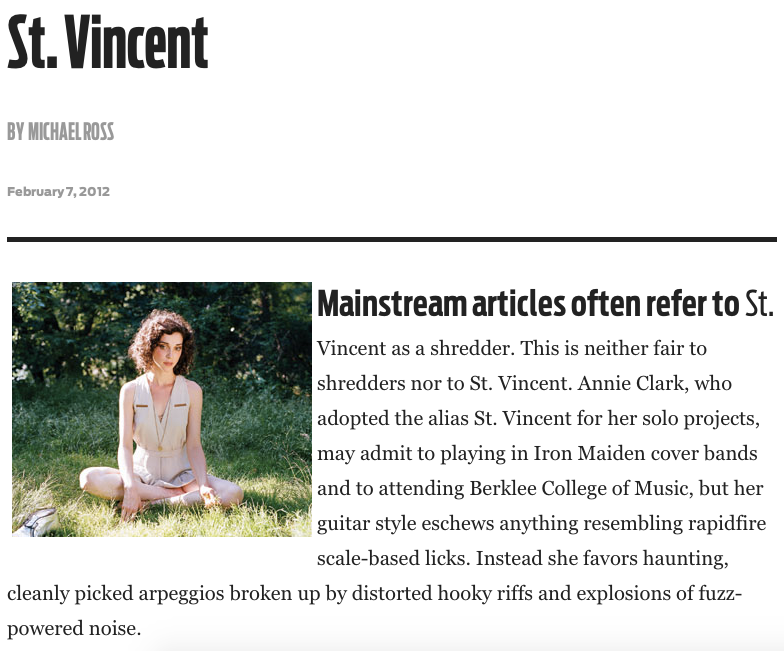 It’s great for transitions between songs, filling out quiet parts of songs, and is also really useful for recording," says Mike, in Paste magazine's [article](http://www.pastemagazine.com/blogs/lists/2012/05/14-guitarists-talk-about-their-pedal-boards.html?a=1). On this reddit page, we can see Jamie's pedalboard as well as others confirming the pedals present. Seen at 0:22 during their Audiotree Live session. "It's whatever kind of reverb you want," says Joe Hottinger, about his Cathedral Reverb pedal, at 37:45 in this rig rundown. 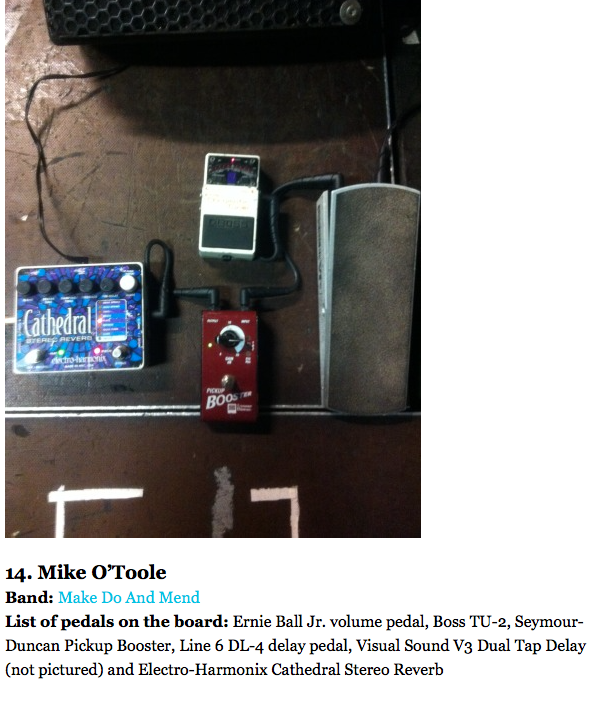 According to photo provided by Tim Grime, Koppes uses Electro-Harmonix Cathedral Reverb. On the second board, the big blue pedal is an EHX Cathedral. In this picture, an Electro Harmonix Cathedral Reverb pedal can be seen at the front of Harry's pedalboard. He uses this for songs such as California Daze and 1998. Soren has been seen using the Electro-Harmonix Cathedral at some of recent shows. "We caught up with country music singer, songwriter and guitarist, Chase Bryant, on his recent national tour and sat down with him to demo three Electro-Harmonix effects: Cathedral reverb, Ravish Sitar and Micro POG." - featured on EHX website. The Cathedral Pedal can be seen to the left of the DSI Tempest. In the photo of Greenberg's studio, we can see the Electro-Harmonix Cathedral reverb pedal. in [this live-in-studio performance by Wire](https://youtu.be/fJrOfPWOAro?t=8m24s), Simms' pedalboard is shown to include a Cathedral. In the Facebook photo taken by Erin regarding his new Pigtronix Looper, he has a Cathedral by EHX on the top-left corner of his board. "Kevin picked up a Cathedral stereo reverb and Andrew grabbed the MEL9 tape replay machine." My live set-up is exactly the same as my studio set-up, minus a couple keyboards: Roland SH-101 Roland TR-707 MFB 522 MFB Fliterbox EHX 2880 loop pedal EHX reverb pedal Casio SK-1 Yamaha DX100 MPC500 and a small mixer. At 2:16 you can catch a brief look of his pedalboard and the cathedral is among other pedals on it. Taken from his instagram story as of 26/03/18. Video only lasted 24hrs so had to reupload. It is seen at the bottom left corner of the board. The EHX Cathedral Reverb is seen here on Black Marble's pedalboard. Pedals used in this video: Cathedral Reverb and Memory Man With Hazarai. Visible as a blur in the first slide of this Instagram post by David Boring, as well in the tenth slide of [this Instagram post](https://www.instagram.com/p/BiR0feuHf4i/) and in [this Facebook post](https://www.facebook.com/davidboringhk/photos/a.237893603069259/959243840934228/?type=3&theater). Seen on Johnny's Pedalboard in this particular set of Photographs. The Electro-Harmonix Cathedral Stereo Reverb pedal surrounds your tone with an aria of rich presence. It's loaded with 7 different types of reverb plus digital echo, all of which work in true stereo. Full programmability lets you recall previous settings instantly. The EHX Cathedral Stereo Reverb lets you create the perfect space for your instrument or voice while offering an elegance that takes your music to a higher ground. The Cathedral offers two spring modes: Grail Spring, based on the Holy Grail's spring emulation, and Accu Spring, an Accutronics spring tank emulation. Top notch, professional Hall, Room, Plate, and Reverse reverb algorithms. Grail Flerb mode is the EHX Holy Grail Flerb with greater adjustability. Echo mode makes the Cathedral into a versatile 2-second digital delay. Up to 2 seconds of Pre-Delay, with Feedback allow for reverberant echoes. Tap tempo footswitch sets the pre-delay time with your foot. Instantaneous infinite reverb is yours by pressing and holding the Tap footswitch. Tone controls on the reverbs allow for further refinement of the sound. True stereo in and out. The only reverb pedal you'd probably ever need (unless you don't want to tweak it onstage). I would say the only con I have for this, is the white preset switch can be easily flicked on which can send you from having a smooth custom tone, to a squall of reverb. In any case, great reverb pedal. This pedal is a TON of fun to mess around with. Plug in stereo amps and this thing will blow you away with real 3d soundscapes. The left toggle switch (when held down) holds the reverberated notes infinitely, great for transitions between songs in a live setting. Loads of fun and will hold up to a 30+ second reverb. Though I will say, when putting it at the end of your signal chain on your pedalboard (especially with any overdrive engaged) it does tend to get a bit muddy. It is not a pedal you run though on your board and away you go. It will take time to figure it out and perfect its use, much like many other EHX pedals. I have just recently added this pedal to my rig. I was very tempted to go for the much smaller easier to use holy grail reverb but decided to go all out and get the cathedral. The main reason I went for this over the holy grail? The infinite reverb switch is nuts! Great for starting and ending sets with and when dialling up the feedback and pre delay it can make a massive echoey loop which is awesome. This pedal also includes the famous holy grail reverb along with some other great options such as reverse and classic plate reverb. This is my new favourite pedal and is going to be used a hell of a lot live. The ambiance this pedal creates is seriously great. Especially love the Grail Spring and Hall setting. It's great that you can set your reverb in perfect detail AND save it as a preset afterwards. The Echo setting makes this pedal even better, this reverb pedal gives you a delay function with tab which is awesome. The only real downside on this pedal is that it reduces the volume of my dry signal. Great Multi-Effect unit. Makes interesting spring-reverb sounds, deepest endles atmospheres and nice echo. While this is a great pedal I have two small complaints. It takes a little bit of volume out of my amp when it's not plugged into the effects loop (I'd like to keep it in the effects loop all the time, but in small gigs this isn't always possible). Also, the line between too little and too much reverb is very, very thin in my opinion. For some this might not be an option, but I find myself tinkering too much to find the right sound more often than I'd like. Still though, great pedal. This reverb pedal is amazing. The ability to save different settings per each preset reverb is amazing, a total game changer for my rig. This is very versatile reverb. From the holy grail to reverse. It's pretty awesome. But the problem with customization and the saving it; no easy way to switch from one preset to another. I will NEVER get rid of this pedal! I love this pedal so much. If you use any type of reverb, this is the pedal to use. Though practically, for me, I use the pre-delay settings just as much as the reverb end of things. I have a delay pedal after this in my chain, so I get reverb and some delay stacking that gives me an incredibly beautiful sound. Great reverb peadal which gives your sound just that touch you are looking for ! You got all you want with this. The Freeze function is unbelieveable. The multitude of modes on this thing means you can use it for almost anything. There's plenty of reverb modes and options, it has delay that you can turn into a kind of chorus, and it has more psychedelic effects like the reversal. Lots of room for doing anything between basic reverbs and crazy walls of sound via infinite resonance. Great build quality and fantastic sound! Fantastic pedal with eight, all adjustable, reverb profiles. One of the highlights of this pedal is the reverse reverb - which can be used to give leads an eerie and unique ambience. Sounds a little too digital for the pricetag, Reverse and infinite settings are cool though. sounds good with synths. I dont use it much with guitar. Use it all the time, cannot be without it!